Art has many facets and functions. While artistic tendencies can be trained and cultivated, the propensity to observe, to analyse, and the desire to express is a fundamental aspect of our nature. Functionally, art brings people together, illuminating our capacity for connection. Art draws us in as a family, as a society, and acts across time and space as a prime marker of our species. Brian Tunks, the Canberra designer behind Bison, has known this for a long time. 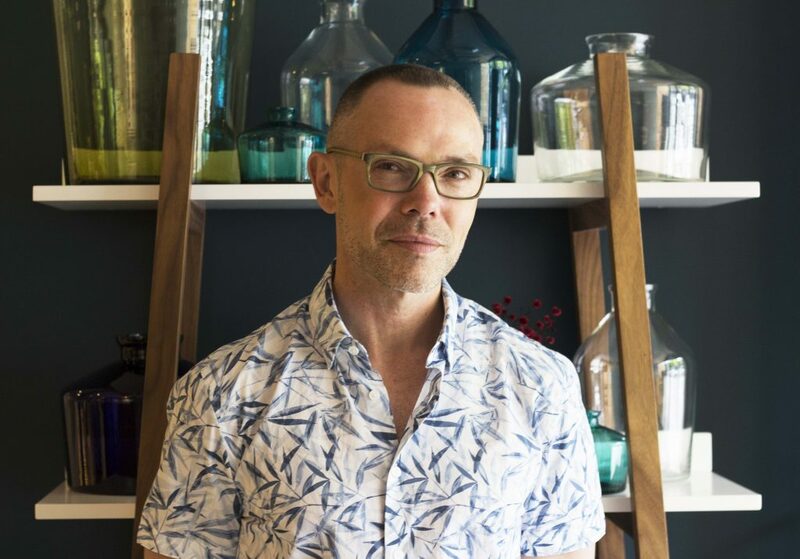 Bison, famous for its ceramics and glass, recently celebrated its 20th anniversary and Tunks sat down with me to discuss his art, and how a once personal vision has grown and now affects so many. Listening to Tunks you immediately get a sense of Bison’s values and philosophies. Style, harmonious with functionality. Beauty, but not at the expense of humanity. Materials of elegant fragility, albeit charged with a dignified endurance. Design and production that captures hearts, and pulls in the eager eyes and hands of buyers and creatives all around the globe. Bison has 20-30 colours that it works with and, as is the inescapable truth for all artists, through his colours and designs Tunks allows us a glimpse into his mind. His art is inspired by aspects of his life, such as childhood memories, or elements of the everyday that have left an impression. “They are colours that evoke response, or a reflection.” Bison is continuously built on by Tunks’ memories, whether it be the colour of a flower that was in his kitchen, or the memory of his grandfather’s orchard in the Blue Mountains. “There are stories behind what I do, like my milk bottles, and the Fagel pitchers. Fagel is the Swedish word for bird, and the reason the pitchers came in to being is that as a kid I used to ride to school in Sweden on the bike path and what would happen is that these birds have the right of way as they are the state bird. They were evil things and they would all pull up in front of you on a black ice path and twenty kids would go down looking like contemporary art in a big pile, and they would just keep waddling! The neck profile, or the spout, is the angle of their heads as they walked on in front of me and kept going! Tunks seeks to create lasting items that withstand the test of time, both steadfast through fashion seasons, but also physically enduring. If you look closely, finely raised or engraved in all the Bison pieces is a line drawing of a bison. The Bison symbol was hand-drawn by Tunks, and originated from his appreciation of the beauty of the Bronze Age cave paintings in Altamira. “To me they were so powerful because they were simple line drawings but they conveyed movement, fear, emotion.” Even the details of the Bison brand resonate a sense of connectedness, celebrating that which lasts, and the manner in which art can call out to us over the centuries; the powerful way an ancient civilization’s art can still move us today. Excavating out on the field in Syria, near Aleppo, Tunks worked with the local Bedouin people. “It gave me a very different perspective on a sense of time, and the sense of cultural permeation, how things flow into each other. It’s quite phenomenal.” It appears that with this social conscience, comes Tunks’ understanding that art is for everyone, and it is uniting. He also understands that Bison is a mechanism with which to do that, to bring about a collective, a family of creatives who connect and thrive through their work. “We are a global community”, says Tunks who went to school in Sweden, grew up in rural NSW, went to university in Canberra, dug artifacts in Syria, and is inspiration by the beauty of the Asian cultures. Due to a life of travel, and an expansive take on the world, Tunks has a global sense of perspective. Whether it’s glass, ceramics or linen, he seeks to create connection through the most innately human element of humanity, art. And Bison is his bronze-age tool to do this. Tunks spent 16 years producing Bison pieces in Canberra, first in his father’s shed (“He asked me to get out because I rusted all the tools because I wasn’t venting the kiln properly”), then in a studio in Queanbeyan before moving to the Bison studio in Pialligo. With its increasing popularity, the ever-growing Bison realised it needed to expand its horizons and seek artists from outside of Canberra to assist with production. While that is a difficult step for any artist, to put your vision in the hands of another, Tunks took it in his stride and travelled the world to select artists whose skills he has nurtured and harbored. He now shares a Bison family with artists he believes in. And in that act alone, of distributing the production of Bison over cultures and locations, Tunks has done something very special. He has connected people through his art. On the Bison website and in conversation, Tunks promotes his multicultural Bison family, and proudly regales me with stories of his overseas artists whom he trains, but also learns from. He tells me how excited he is to be heading overseas soon, and laughs that the studios are “so often much cleaner than mine ever was!” Bison works with a woman in India on a line in linen, and a third-generation family of glass blowers in Thailand, and a family business in the Philippines working with porcelain and bone china. And all these artists, who have generations of specialty within their field of production, Tunks knows personally. “I go and spend time in studios showing artists how to form spouts, how to attach handles, how to do the glazing so that it’s seamless across all of them, but still feels incredibly artisanal. There’s got to be humans behind these processes.” His Bison team in Canberra also gets a lot of love. For example, Tunks has named some of his glass pieces after his nieces, Eve and Isla, and after his great friend across the road, Lou Lou, co-owner of Moxom + Whitney. The staff in the Canberra stores (Annabel pictured) also feel very much a part of this Bison community, as Brian creates a family, local and international. Tunks has such a sense of perspective on the world, and sees art as tying people together. “It is a unifying factor, in a time of great instability. And I think we should be celebrating it, and grabbing it with both hands.” Tunks’ artistic success also stands as proof that art is inherent within the human spirit, as he is completely self-taught in all areas of his artistic pursuits. Considering the writing and producing he has done for Vogue, the styling for restaurants, hotels and Californian eco spas, and his success in ceramics, Tunks laughs in bemusement when he reflects on the absence of any formal training.